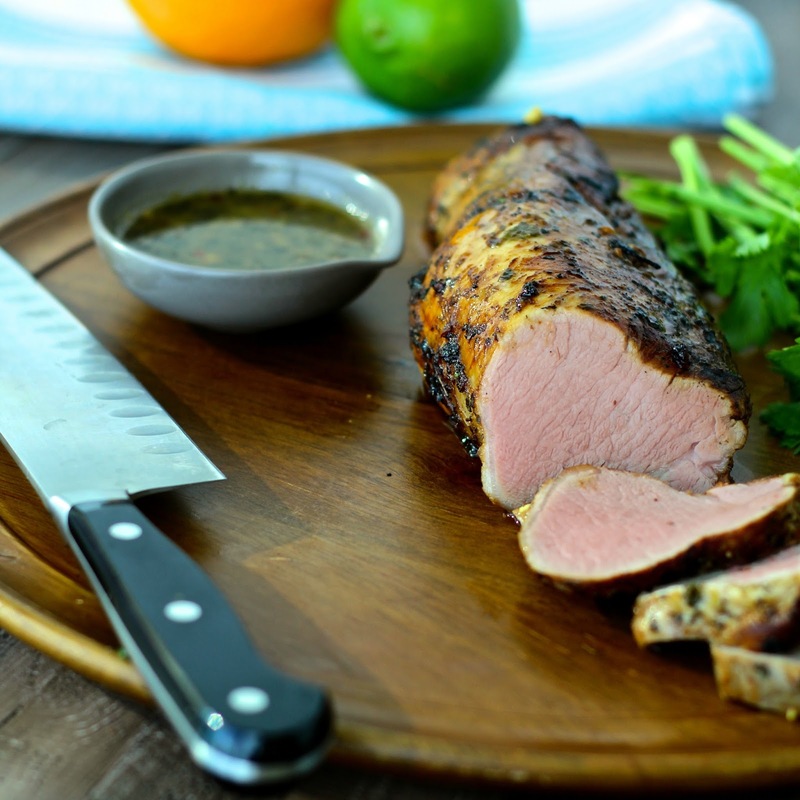 My Mojo Pork Tenderloin is packed with bright Cuban flavors. Cook it in the oven or on the grill for the perfect summer meal. If you’re looking for a nutritious summer recipe that the whole family will love, then this dish is for you! 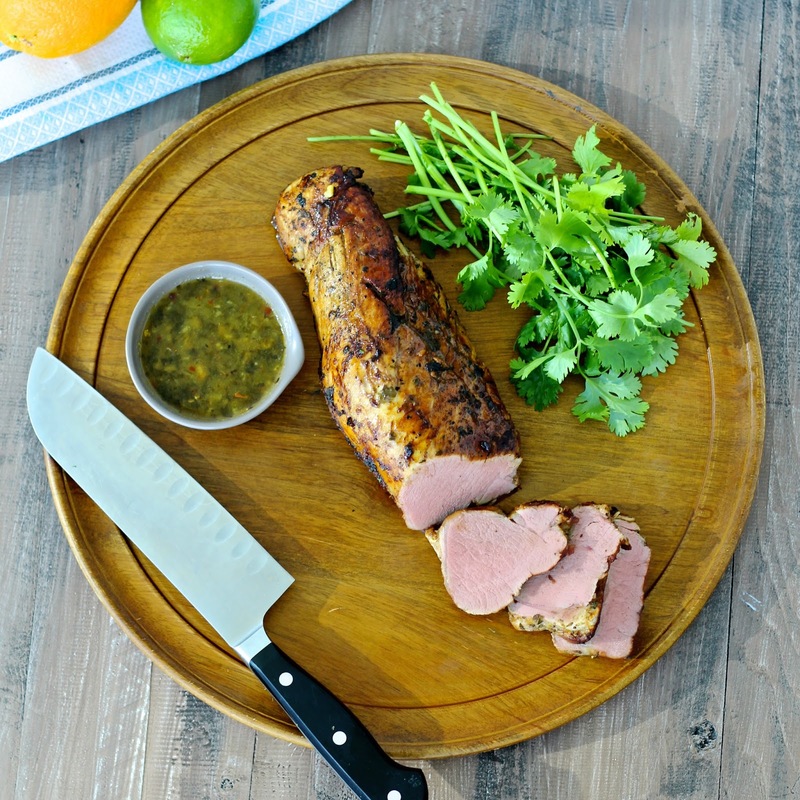 My Mojo Pork Tenderloin is packed with classic Cuban ingredients. Fresh citrus juice is combined with garlic and spices to infuse the pork with bright flavor as well as a hefty dose of Vitamin C.
Pork tenderloin is a lean cut of pork that’s a healthier alternative to higher fat cuts like bacon, sausage, pork belly or spareribs. It’s low in fat and rich in protein, B vitamins, and minerals like zinc and selenium. Nutritionally, it’s similar in profile to chicken breast with even fewer calories per ounce. Tenderloin has a mild flavor that takes well to marinades like the one in this dish. The best way to cook it is to roast it in the oven after a quick sear in a hot pan or simply grill it. You can also slice it and use it in dishes like stir-fry. Because it is so lean, it’s a quick-cooking cut and can easily be overcooked so keep an eye on it when it’s in the oven or on the grill. I like to serve this dish with rice and black beans or mashed sweet potatoes. This dish is featured in my upcoming cookbook, Natural Pregnancy Cookbook: Over 125 Recipes for a HealthyPregnancy. Trim any fat and silverskin (silver colored connective tissue) from the tenderloin. Mix the orange juice, lime juice, garlic, cilantro, cumin, oregano, salt, and red pepper flakes together in a bowl. Pour about half of the mixture into a one-gallon resealable plastic bag. Add the pork to the bag, close and refrigerate for at least 30 minutes or up to 4 hours. Pour the remaining half of the mixture into a small saucepan and simmer on the stove for a few minutes until thickened slightly. Reserve the sauce for serving. When ready to cook, preheat the oven to 400°F. Heat the oil in a large oven-safe skillet (cast iron works well) over medium high heat. Remove the pork from the marinade and add it to the pan. Sear the tenderloin in the pan, turning it every couple of minutes, until it’s nicely browned on all sides. Place the skillet in the oven and cook about 15-18 minutes, or until the internal temperature of the pork measures 145°F on a meat thermometer. Alternatively, the tenderloin can be cooked on an outdoor grill. Remove the tenderloin from the oven and let it rest on a cutting board for 5-10 minutes. Cut into ½-inch slices and drizzle the reserved sauce on top. I can't eat pork, but I lovelovelove the ingredients you used with it! :O I'm gonna have to try this with some other kind of meat! <3!! i dont eat pork but i'd definitely try the seasoning on other meat.. IT looks really tender and absolutely delicious – I love the flavours in it. I really love experimenting with new spice combos but sometimes don't know where to begin!! The cumin, citrus and oregano sound absolutely amazing!!! 🙂 I think I'm going to have to give the spice combo a try! Thanks Tara! This is definitely one of my favorite sauces, it's so flavorful! I hope you like it too! Oooh yum!!! I love pork marinated in citrus flavors. This looks delish, Sonali! Thanks Katie!! I just checked out your recipe and it sounds amazing! Just looking at this loin is getting my MOJO riled up. LOL! oooo YUM. Rarely eat pork, but next time I do, it'll be this one! Woow! It looks very, very delicious! This sounds fantastic! Love all of the spices and the orange juice added. Looks like it has so much flavor. Beautiful photography and recipe. At an old job we always braised pork shoulder and turned it into pulled pork. I was never satisfied with that recipe, there was much left to be desired. However, I loved the idea/presentation of medallions with the pork tenderloin. Not to mention, I'm sure the flavor is much bolder than the braised pork shoulder at my old job. Sorry, I should have clarified. The braise was in a mojo style. Thanks so much for stopping by and leaving such a nice comment! I over cooked my mojo pork tenderloin in slow cooker….now it is very dry. What can I do to fix it? I’m sorry to hear that! You can try serving it with a sauce to moisten it.